Synopsis: Fate and fortune. Power and passion. What does it take to be the queen of a kingdom when you’re only seventeen? But Akaran has its own secrets — thousands of locked doors, gardens of glass, and a tree that bears memories instead of fruit. Soon, Maya suspects her life is in danger. Yet who, besides her husband, can she trust? With the fate of the human and Otherworldly realms hanging in the balance, Maya must unravel an ancient mystery that spans reincarnated lives to save those she loves the most. . .including herself [x]. Review: It’s been a while since I’ve read a YA novel that was written so well. Chokshi’s writing style takes you from the real world and immerses you into the one she has created. Not only was the writing amazing, but she gave the book an Indian influence which is not typically seen. It told the tale of arranged marriages, harems, folklore and reincarnations. The main character has been given a terrible horoscope at birth. One that causes those around her to despise her and treat her poorly. Then one day it changes and she meets Amar. This is truly when the story begins. 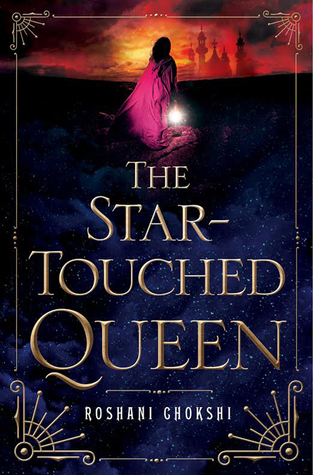 The Star-Touched Queen might actually be my favourite read of 2016 so far! There wasn’t much that I disliked about it but I have a hard time giving books the full 5 stars. I highly recommend this read!! This entry was posted in book review, netgalley. Bookmark the permalink.